Will an alternate headline make this news any easier to swallow? Let’s take a look. Now teachers everywhere will have to banish almost all traces of great literature from their classrooms, and especially from their English classrooms. Instead, the CCSS dictates the use of such boring “informational texts” as a bunch of raw data, official papers from a Federal Reserve Bank and the General Services Administration, and some arcane speeches by dead people with no support material whatsoever to help put the material into context. Want more? Calling the Common Core “misguided,” a Massachusetts’ specialist in pre-K-12 educational standards says that teachers “hate the Common Core, they hate the idea they have to teach nonfiction.” She says its supporters are “trying to elevate fact-based reading and writing at the expense of literature and creative writing.” So what are we—chopped liver? And then there’s this: “The effect of the new standards is to drive literature out of the English classroom,” says a professor from Teachers College at Columbia University. What? This article spans three pages in one of the nation’s most prestigious newspapers, and not one single mention is made about the outstanding nonfiction literature written specifically for kids?? WAKE UP, WASHINGTON POST. At this very moment, we are basking in the glow of a Golden Age of nonfiction. The best of these books bring to life some of the most exciting and riveting stories of all time, and better yet, these are books kids love to read. What a great way to make learning about the real world fun and memorable at the same time. And how misleading to omit an entire genre of compelling, beautifully written and illustrated, meticulously vetted, totally accurate, and thoroughly entertaining books from an entire front-page article in one of America’s most prominent newspapers! What’s more, the best of the best nonfiction books can easily be tied to every aspect of a school’s curriculum, from English to math to social studies and science, making cross-curriculum work a pleasure. 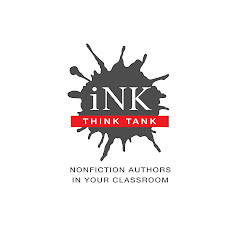 In all probability, the reason you are reading this blog is because you already know about these books and might be a fan of the nonfiction authors who write for INK. But judging from the newspaper piece, there are plenty of educators out there who still don’t get it. So would they like to check out some examples of great nonfiction literature for kids that's a perfect fit for CCSS? Sure, be my guest and make things easy….just send them here. Take a gander at the dust jackets of a bunch of INK’s award winning books. Then go to the top of the page, click on Find the Books, and sign into the free online database, where you can generate entire lists of books geared directly to any subject you have to teach - or for that matter, any subject your heart desires. Thank you for pointing this out, although it was an entirely unpleasant experience to wake up to this morning. Already, the incorrect news presented in the Post is spreading. One blogger has already posted a reference with the headline, "New Common Core Standards Remove Literature from English Class." We do have a reading comprehension problem in this country, apparently at every level. Those of us who understand the potential of nonfiction trade are going to have to start talking even more loudly and more often! Wow! Roz! Them's fightin' words! Thank you for being our "Paul Revere!" May this post go viral. And read my post tomorrow to find out how all you teachers and administrators can join us in this battle. Yikes! It also would have been helpful to interview a few kids and ask them what they like to read, before assuming that they prefer fiction. Wow! We do indeed have a national comprehension problem if we can't understand that the Common Core is not asking teachers to abandon fiction. It is asking them balance their offerings so that students have the chance to read excellent nonfiction. AND, that reading needs to happen across the curriculum so that math, science, and social studies teachers are sharing with students how to read in their disciplines. So the idea that content areas teachers should refuse to teach reading is nonsense, since every discipline promotes a specialized kind of literacy. Our challenge is to connect the curriculum in schools with outstanding nonfiction so that this literature supports and extends what we are already doing. With at least one INKer on it!!! I hope part of the response includes letters to the Washington POST editor making the points you just made in your blog post! Let INK ideas reach the general public. This is a great point. We love nonfiction in our house, and have been as moved and inspired by great nonfiction for kids as by fiction. I see Common Core as an opportunity to get the kids who already prefer nonfiction excited about reading in the classroom, and to share great nonfiction stories with kids who wouldn't have chosen them. My son was such a strictly nonfiction reader that he pretty much listened to his first fiction picture book in second grade, and this introduced him to some great stories. The same will be true for fiction readers now.